It appears the 2 newest arrivals to the U.S. Supreme Court got an advance copy. Appears, too, they've heeded this sage advice from Wald, onetime Judge on the International Criminal Tribunal for the former Yugsolavia and Chief Judge of the U.S. Court of Appeals for the District of Columbia Circuit. Since Kagan was seated at the beginning of this October Term 2010, "the tenor of the debate has changed," David Savage, Supreme Court correspondent for the Los Angeles Times, recently reported. For years, he wrote, "Supreme Court conservatives led by Justice Antonin Scalia dominated the debates during oral arguments." 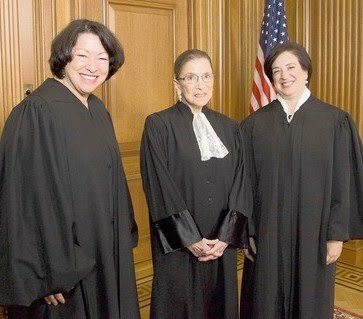 But now Sotomayor and Kagan "have joined the fray and reenergized the liberal wing." she has displayed a quality — call it what you will — that is alert to the humanity of the people whose cases make their way to the Supreme Court. Amid reports that these new, "smart, fair, and hardworking" Justices may be shifting balance on the Court, Justice Scalia publicly renewed his attacks on substantive due process applied to enforce rights of women (and, here, gays).